Ladies and Gentlemen I am back! Each Friday going forward I am going to endeavour to post some new recipe ideas for you. So watch this space! Today I have whipped up three different pâtés any one of which would make a great little starter if you have friends popping over, or as a light lunch with some salad or other nibbly bits. The first pâté was mackerel pâté which is a personal favourite of mine. Mackerel pâté takes a matter of minutes to make and is scrummy served on fresh bread, melba toast or even that 70s throw back a vol-au-vent. Second up is a vegetarian option, roasted red pepper and olive pâté which requires a food processor to blend the cream cheese and red pepper together. This pâté is wonderfully light (a result of blitzing the cream cheese in the food processor) and the red pepper gives it a slightly piquant but sweet flavour. If you are tempted to blend all the ingredients together I wish to warn you that the olives will give the pâté somewhat grainy texture. This entry was posted in cheese, duck, fish, main meal, quick & easy, recipes, starter, vegetarian and tagged food, foodblogger, foodphotography, healthyeating, homecooking, recipes on April 22, 2016 by Antonia Cooks. Due to the cold and wet weather we have been ‘hibernating’, taking refuge close to the wood burner and/or Rayburn. Consequently, there has been time to ‘play’ in the kitchen and cook things that take a little bit longer. This is a new recipe that I came up with before Christmas. I think what makes this dish is the sauce that is made from the juices that the duck is cooked in. 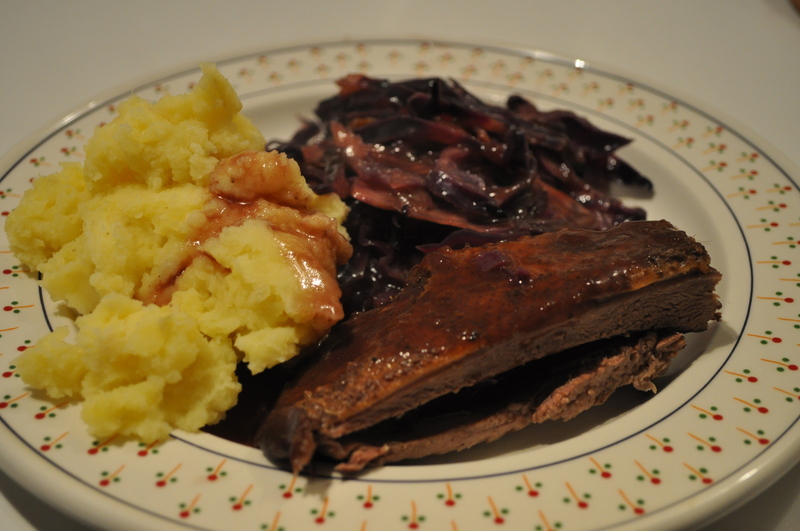 The sauce has a lovely deep flavour which is lifted by a little redcurrant jelly that complements the duck nicely. 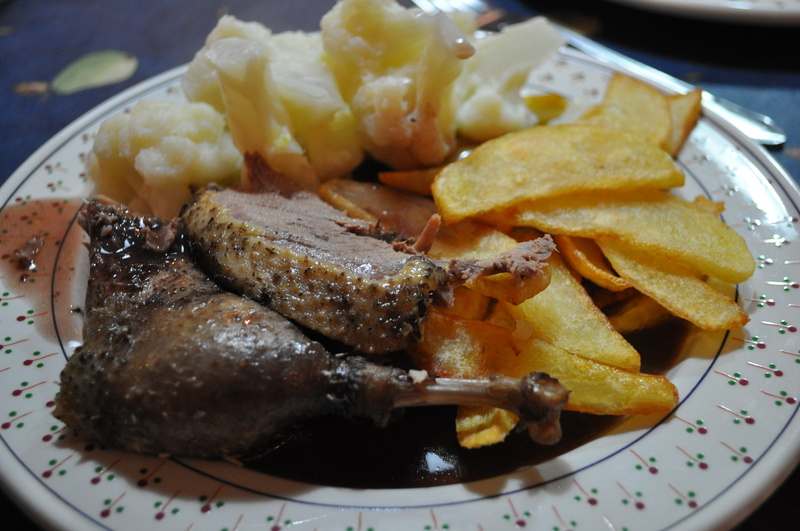 I tend to serve the duck with either mashed potato or chips so that you can really soak up the juices. 1. Prepare your duck by removing the wings and the giblets. (Use the wings and giblets to make a stock following the guidelines below). 2. 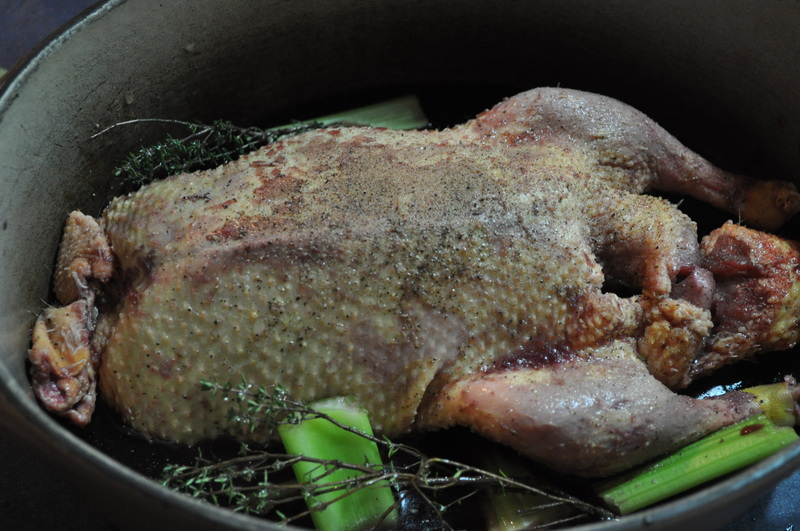 Place the duck in a large casserole pan along with the wine, water, bay leaves, thyme, juniper berries and celery. Season well and then place in a preheat oven at 170C fan for 1 hour. 3. After an hour, remove the duck from the casserole dish, cover with tin foil and allow to rest in warm place for 15 minutes whilst you make the sauce. 4. Pass the juices from the casserole dish through a sieve to remove the celery and any other bits and pieces; then place in a saucepan on a high heat. 5. Add the duck stock and the redcurrant jelly and bring to the boil. 6. After about 5 minutes add the corn flour paste, stirring continuously so that you have a smooth sauce, taste and add more stock or redcurrant jelly as required. Serve. It is incredibly simple to make any meat stock for use in a soup, risotto, pie, gravy etc. Stocks can be frozen so are worth making even if you can’t use them straightway. So, make sure you save the bones after a roast. There is no right or wrong way for making a good stock. Below are merely the guidelines on how to make a basic stock which you can vary according to what vegetables you have lying around. 1. Place all of the ingredients in a large saucepan, add enough water so that the bones are covered then cover with a lid. 2. Cook the stock on a medium heat for at least an hour but preferably 2+hours in order for your stock to have a lovely deep flavour before passing it through a sieve to remove any bits before using. (Allow to cool completely if you are freezing the stock). This entry was posted in duck, game, main meal, recipes, sauce and tagged eats, foodblogger, foodie, healthyeating, homecooking, recipes on January 21, 2013 by Antonia Cooks.